There was only one room left to remodel….. How hard could it be right? Ha! What an adventure… it isn’t done yet. I started removing the horrible 90’s wallpaper the beginning of December with the plan to have the walls done by Christmas week so we could redo the floors. Well, I worked on the walls on the weekends and a few nights, but the paper would not come off the walls. I don’t think it was as bad as the half bath downstairs, but it was bad. This was my fourth room to remove wallpaper (3 were the bathrooms which are a huge pain). I have a pretty good technique now, but most of the wall still comes down since it wasn’t put up correctly. Anyway, we took the week of Christmas off to finish up the bathroom, but I didn’t really figure Christmas into my plan so we didn’t have as many days to work on it as I thought. We patched and sanded and patched and sanded and the walls still aren’t right. We painted them anyway… Just don’t look too closely at them or the other two bathrooms or kitchen for that matter. When I am pulling the wallpaper that seems like the hardest job until I start sanding. I really don’t know which is worse. I picked out light fixtures, but when we removed the old ones we found they had pretty much punched a hole in the wall so we couldn’t install the lights I picked out since there was no wall to mount them. I picked out some different ones which I don’t love, but they were cheaper and I like them. Anyway, we managed to finish the walls leaving us the weekend for the floors. In trying to find out how thick our sub floor was we realized the linoleum that was in the bathrooms wasn’t glued down No, our cheap builders just stapled it down which we thought was a blessing at first. We had planned to just tile over the linoleum, but since it just pulled up we felt we shouldn’t tile over it. After we pulled it up we discovered a squeak in the floor that we don’t remember from before. Then we found out you can’t tile directly on plywood sub foor so we bought hardibacker boards to put down (which didn’t fit in the car, thank God dad’s truck was nearby). Of course putting in the new subfloor and tile will raise the floor at least 1/2 inch which means now we have to shave down the doors and raise the toilet. I was thinking of just putting in new linoleum, but Casey said we would have to fix the squeak anyway so we might as well go ahead with the tile. We can’t install the tile until the squeak is gone so Casey put about 20 screws into the sub floor, but the squeak persists so now we have to call in a contractor. We also pulled up the floor in the small bath to find the sub floor around the toilet is in bad shape and has to be replaced due to leaking in the toilet which also has messed up the ceiling downstairs. So, after many trips to Lowe’s and much money the floor still isn’t done, but the walls are done, the lights are replaced, the new blinds are up, the new fixtures have been bought on ebay (super cheap, let’s hope they don’t look super cheap) and the sinks, shower and tub are cleaner than they have been since Casey bought the house (Thank you Mr. Clean Magic Eraser – absolute best product on the market even made the old grout white again!). Maybe this weekend we can start on the floor if we can get a contractor in here this week. We have learned a lot about toilets, walls and flooring in the last month. I really do like learning about this stuff and we certainly know what to look out for in our next house. I pity the builder who has to work with us if we build. After seeing the many corners they cut on this house we are much wiser. We would not know these things if we hadn’t done this work ourselves. It is stressful and frustrating (yes I almost cried in Lowes), but I do enjoy it. Here are a few pictures of the journey. 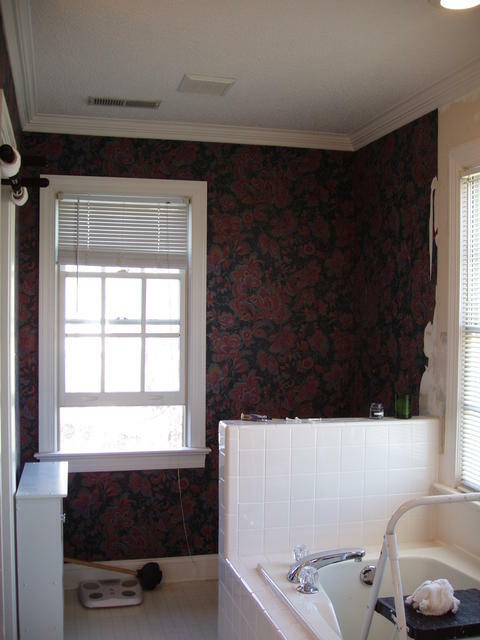 Final Bathroom – check out those nice plywood floors! Here is what J.D. did the WHOLE time. He didn’t mind the noise at all… just kept sleeping. :) I am pretty sure in my next life I would like to be a spoiled house cat. Check out my gallery for more picture of the lazy cat the bathroom remodel. Wow… That looks GREAT Huge difference. You are so creative!